Oral surgery is a branch of dentistry that deals with a wide variety of conditions and treatments. Extractions, wisdom teeth removal, dental implant placement, removing oral growths–these are all considered oral surgery because they require specialized training and involve cutting into soft tissues in one way or another. At Metropolitan Dental Care, we offer oral surgery services, so you won’t need a separate care provider when you need these types of procedures. Whether your child’s wisdom teeth are ready to come out or you need a tooth extracted and replaced, we are here for you! There are several reasons why teeth need to be extracted. If there is decay and the infection has spread outside of the tooth, an extraction is often needed. Sometimes a tooth must be removed before starting orthodontic treatment. In these cases, single tooth extractions can be a simple, short procedure, in which only a local anesthetic is needed to numb the area beforehand. We get a lot of calls and questions about wisdom teeth: when should they come out? Do they all need to come out? What happens if we don’t extract the teeth? Wisdom teeth are a remnant from a time in the past when humans ate a very different diet and needed more teeth for grinding unprocessed plants and grains. They are not needed, and, in fact, many people are born without them. It has become a standard choice to have them removed to (a) prevent them from upsetting your alignment or becoming impacted as they try to come in, and (b) prevent them from needing extraction later in life. Not every mouth becomes overcrowded when wisdom teeth come in, and many people have room in the mouth to accommodate them. However, we see a lot of cases where wisdom teeth need to be extracted later in life, due to decay. Since they are located in the farthest corners of the mouth, they can be very difficult to keep clean. Deep decay can often advance quickly, resulting in the need for extraction. The best time to remove wisdom teeth is generally mid to late teens, before they have begun to erupt. However, each patient may grow and develop these teeth at a different pace. Your dentist will monitor your dental x-rays throughout the teen years to see when they are at the optimal time for removal. The procedure itself is a bit different from that of other extractions, since wisdom teeth are usually removed before they have erupted. A patient having their wisdom teeth removed will have sutures closing the holes left in the gum tissue, whereas a standard extraction will not. For patients who require tooth replacement, dental implant surgery is often the best choice. During implant surgery, a medical drill is used to create holes in the jawbone at the site(s) where new teeth are needed. 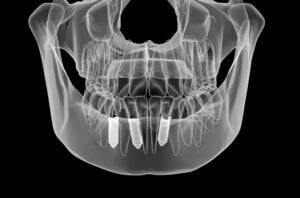 When the dental implant is placed snugly into the holes, new bone tissue can grow in the grooves of the implant and stabilize it, just like a natural tooth root. There are other procedures that fall under the oral surgery category, such as the removal of oral growths that may be detected during a dental exam and oral cancer screening. Overall, many oral surgery treatments require the use of sedation, but some can be performed with only a local anesthetic, such as Novocain. It’s a handy thing when your dentist offers oral surgery procedures, because it means you don’t need to visit a new doctor when life requires oral surgery. Most of us will need a little oral surgery at some point, so at Metropolitan Dental Care, we are pleased to offer these services alongside our routine care in our Denver and Lone Tree, CO offices. Call Metropolitan Dental Care at 303-534-2626 to make an appointment!